Coco Chanel said it the best: fashion fades, style remains the same. The good thing about style is that it doesn’t have a price tag. 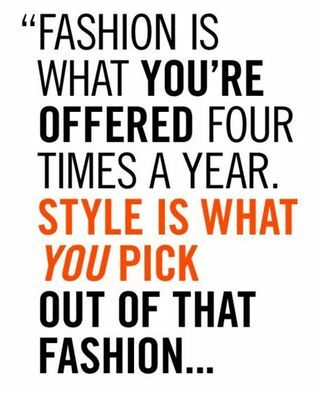 You don’t have to wear designer clothes to have style. It’s all about mastering how you wear clothes, than what you wear. There is nothing more off-putting than clothes that are too small. Some people might mentally have a problem with buying a certain size, but clothes that are too small will never make you look good. Know your body & shape and dress to bring out your good parts and learn how to camouflage your not so nice parts. Don’t be a slave to trends, but find a style that fits your personality. You have to “wear” the clothes and not let the clothes wear you. You can easily personalise your style with unique accessories. Don’t underestimate the “little things”, because they can have a big impact on your overall look. If you keep these 2 style tips in mind, then you have all the basics in house to build your personal image through fashion. This entry was posted in & Other Things, Fashion and tagged fashion, image styling, Patricia Field, personal style, style tips by sofischoice. Bookmark the permalink.